Tomorrow is my birthday, I love to escape somewhere for it and I've previously been to Edinburgh, Dublin and Cyprus. This year I am off to Portugal for a few days, I'm starting to think it's something psychological that I want to leave the country (ideally) almost like a way of running away from that extra number being added on too! We are only using hand luggage as we're really not there for that long, therefore I then had the task of making sure that all of my liquids are within the flight limits. 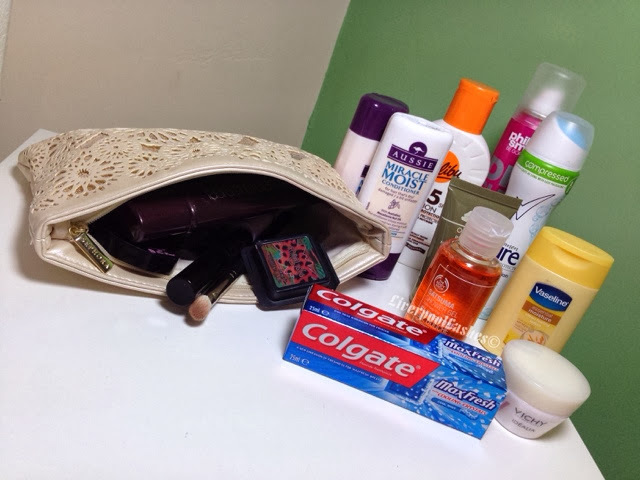 I actually enjoy keeping my make up bag more minimal. To some what I take is probably still too much but for others it's pretty basic, one blush, one or two lip products usually, etc. The one thing I'm absolutely insisting on is my professional hairdryer and blow dry brush. I know everyone will think that every hotel provides them so I wont need it but they're generally terrible and I'd be relying on it to dry my hair as well as straighten it (my hair is actually secretly very wavy) so I am insisting on taking it along with my No Tangles Brush. As usual I've made a video to explain all of the products. I've generally tried to get pretty clever with it all with my small sizes of everything. My birthday is tomorrow too, I hope you have a fab day and a good holiday.